MSMpro is our pure MSM supplement for horses containing 100% quality tested Methylsulfonylmethane – Organic Sulphur. MSM is a vital building block in the cells of the horse and important for cartilage formation, tendons, muscles, skeleton, hooves and coat. As well as being important for amino acids, enzyme and hormone production. 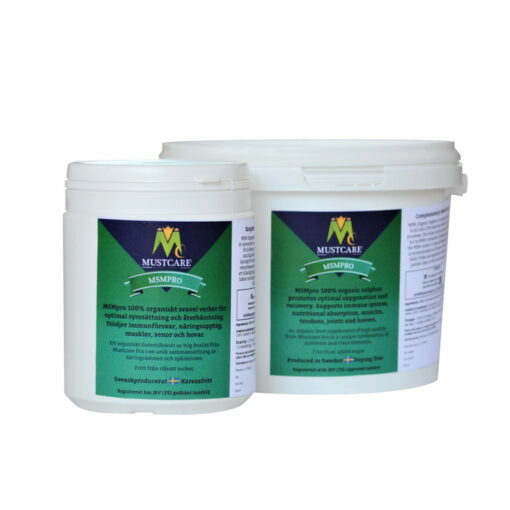 MSMpro is recommended for all horses to ensure a sufficient daily intake and particularly for horses in training, older horses and horses with limited pasture time or low access to grass of good quality. The natural source of MSM for horses is grass but as MSM is a sensitive substance it is destroyed during drying and preservation processes. Therefore the MSM content in hay is low and even lower in haylage. To supplement with MSM is generally seen in shorter warm up time, smoother muscles, higher lactic acid threshold, faster recover, shinier coat, stronger hooves and a higher level of well being. Available sizes are 450 g and 1 kg. Dosage: Pony 0,5 dose measure per day. Horse <500 kg 1 dose mesure per day. Horse >500 1,5 dose measure per day. 1 dose measure contains approx. 15 ml. During the first week it can be beneficial to double the daily dosage. 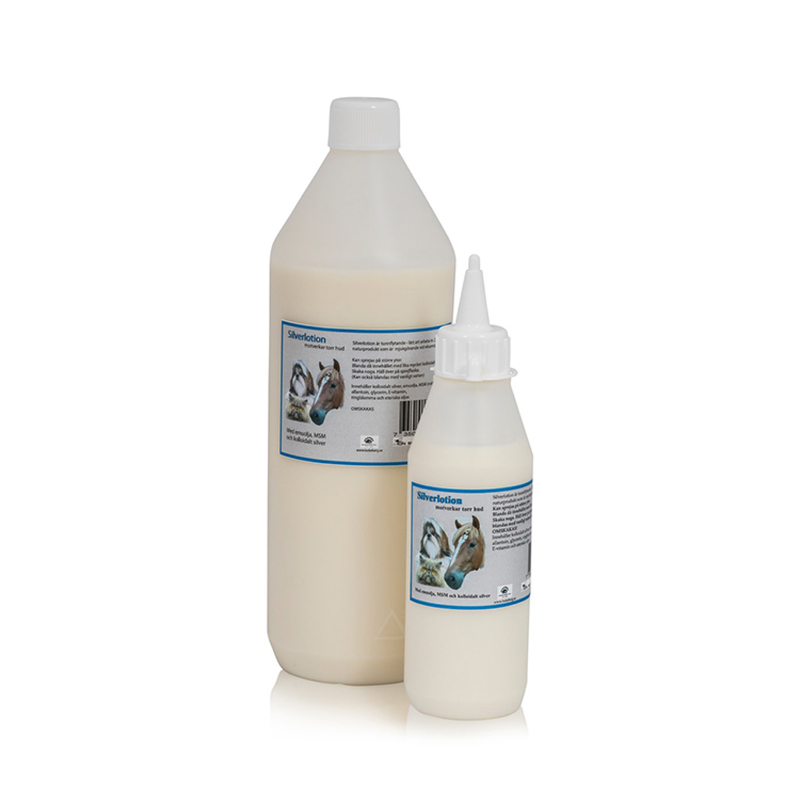 Reseal well after use and store cool or in ambient temperature. Keep out of direct sunlight and out of the reach of children. 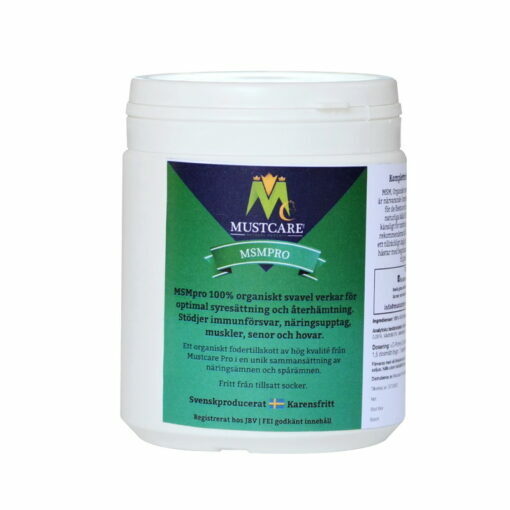 The feed supplements from Mustcare Pro are produced in Sweden with licensed factory and registered with the Swedish governing body for animal feed, Jordbruksverket. We believe in organic supplements of high quality that are bioavailable and have generous levels of active content. We exclude perfume, artificial colouring and sugar from our production. We care for the environment and hope that you would like to contribute by leaving the packing from our products for recycling. 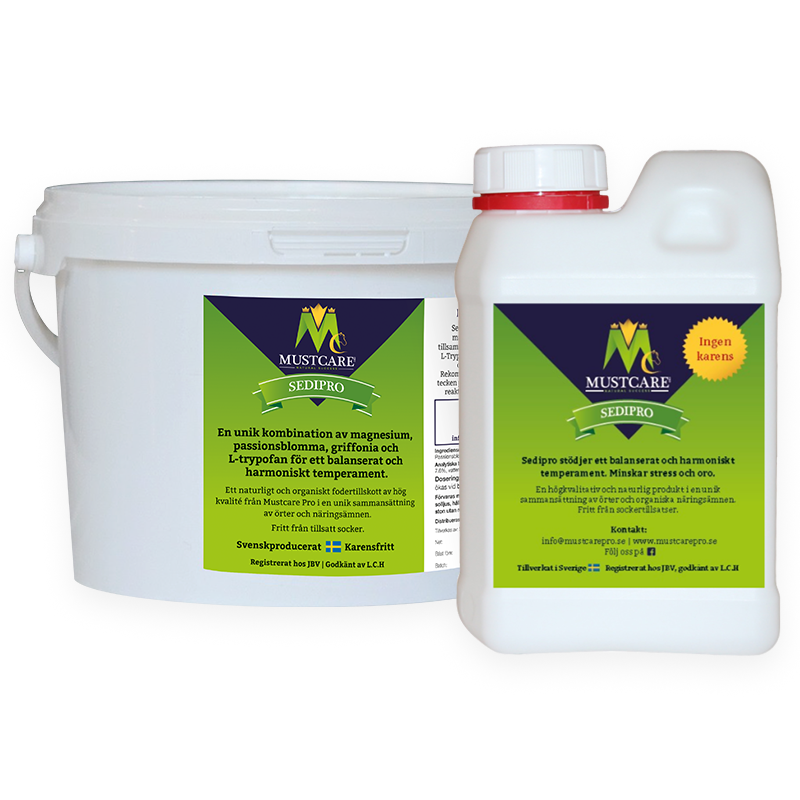 Our MSM supplement for horses – MSMpro – is a cornerstone in our sortiment. 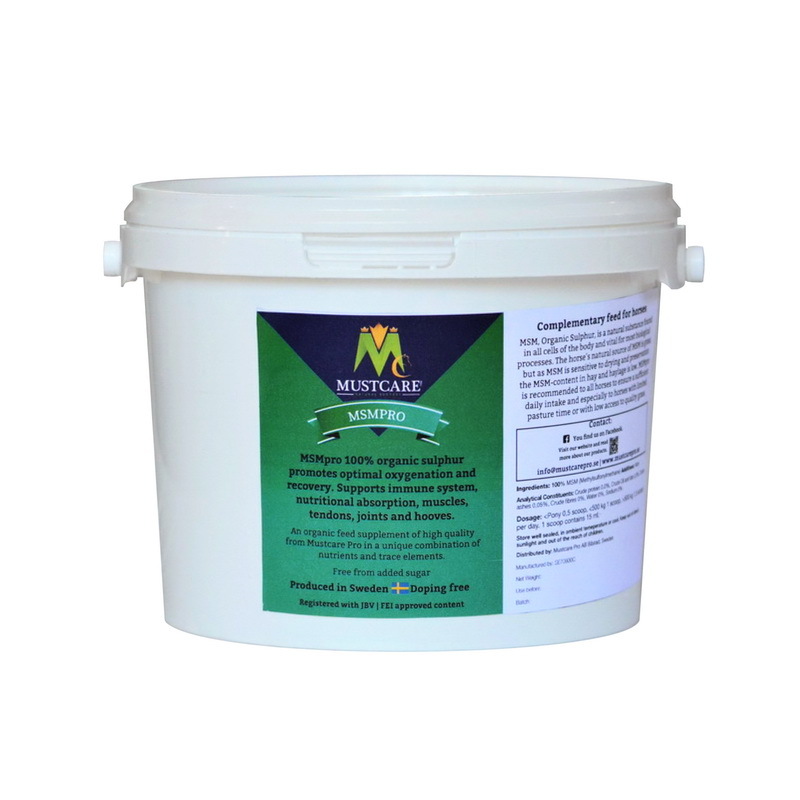 MSMpro contains 100% pure MSM, Methylsylfonylmethane, organic sulphur, carefully analysed to ensure quality and bioavailability. The horse’s natural source of MSM is grass and grazing horses obtain around 1 g of MSM per day, depending on the quality of the grass. Since MSM is sensitive to heating, drying as well as to preservation processes the MSM content decreases when the grass is dried to hay. In haylage the MSM level is close to zero. The need of MSM increases with exercise and with ageing, further, the choice of forage, pasture time and grass quality also affects the individual need. When a deficiency exists supplementing with MSM is often seen in softer muscles, increased agility, better nutritional uptake, improved coat condition, stronger hooves, higher energy and faster recovery. To experience shorter warm up times is also common. This is very positive for the longtime soundness of the horse as muscles working correctly will correctly relief joints, tendons and skeleton. A horse with soft and smooth muscles will of course be more positive towards work and have a higher ability to perform. Why do the horse need MSM? In weight, Organic Sulphur is the eight most common substance in the horse’s body and constitutes an important part in a majority of the body’s biological processes. Firstly, MSM contributes to normal cell formation, increases the elasticity of the cell walls thus permitting more efficient oxygenation and a better nutritional uptake. The elasticity of the cell walls enable a more effective removal of waste products, in this sense, MSM functions as an antioxidant. Further, MSM is involved in the production of amino acids and is a precursor to several hormones such as for example dopamine, which is dependent of MSM. MSM is also important for the absorption of B vitamins B1(Thiamin) and B7 (Biotin). MSM is vital for the production and maintenance of cartilage, collagen and creatine. MSM is also a part of immunoglobulin that is an important part of the immune system. There is a growing body of research around the benefits of MSM, for example studies has shown that horses supplemented with MSM perform better. MSM also has the ability to penetrate the outer skin layer and can advantageously be mixed with lotion. After initial positive results, a lot of research is ongoing on how MSM affects wound healing and helps reduce scarring. For irritated or sensitive skin, MSM lotion is absolutely worth to try. MSM has approximately the same toxicity as water. Starting from the dosage instructions it is possible to adjust the daily dosage until an optimal dosage is found for the individual horse. There are no know contraindications for medicines or other substances in relation to MSM. MSM is an organic substance that for foodstuffs is extracted from gas or wood. In nature the Sulphur compound DSM is formed by microorganisms in the ocean which rises up in the atmosphere in gaseous form. In the atmosphere the DSM is subjected to Ozone and UV light, which gives the transformation to MSM. After falling down with rain, plants absorbs the MSM and concentrates it before it continues in the food chain. It’s been shown that supplementing with MSM has many benefits, but it is important to note that MSM is not a miracle substance or medicine. Many factors influence horse health and should be taken under consideration.